So if you want to build a meditation habit, take ownership of that outcome. Join this meditation challenge today and start your 30-days of meditation. You'll use Calm's free plan for the first 7-days of the challenge. You'll then need to subscribe to Calm. Calm is priced at $19.99 - $69.99/year. This Meditation Challenge is free. There's no charge. I'm not compensated through affiliate links or sponsorships or anything else. I thought "Why not?" and then decided to share this challenge with you. You'll fill out the form below and click "Join The 30-Day Meditation Challenge!" Button. Then, you'll get a special tag, so Kaibot ( ) knows you're taking part in the meditation challenge. You'll receive a daily letter reminding you to meditate. Every day, you'll get a daily letter from me suggesting a meditation in Calm and reminding you to use your meditation app and check in with the accountability app (more on these below). Install a meditation app. I recommend the app Calm. In my letters reminding you to meditate, you'll receive a recommended meditation to do that day. You'll use Calm's free plan for the first 7-days of the challenge and then subscribe to Calm. Fill out this form and then click the "Join The 30-Day Meditation Challenge" button. Then, look for an email in your inbox from me with more information and the next steps. I'll tell you what to do, remind you what to do, and encourage and support you. You'll still need to do the work. With this 30-day challenge, you're getting direction on a specific goal ("Meditate for 10-minutes day for 30-days"), direction to the right tools (Calm.com), and reminders to do the work. You, my friend? You have to show up each day, sit your tuchas down for 10-minutes, and practice meditating (with the suggested meditation in Calm). You'll get an email every day, from me, for 30-days, reminding you to meditate, and suggesting a specific meditation in Calm. This challenge starts today. You can join at the bottom of the page. No one else was, so I decided "Why not?" and then typed a bunch of text and sent out an email about it. "How are you getting compensated? Affiliate links? Sponsorship?" I'm doing this because I thought "Why not?" and couldn't think of a good reason not to. I'm not charging for this and I'm not compensated for this by Calm or anyone else. I'm doing this for the fun and joy of it — let's see what happens! You'll use Calm's free plan for the first 7-days of the challenge. "What makes you qualified to do this?" Seems like the qualifications needed are "Can write and send daily emails." If you're reading this page, you're (probably) a subscriber to my daily letter for freelancers and consultants which, well, you know, the whole 'daily letter' thing. Anyway, for what I'm offering to do to support you in this, what qualifications do I need? You're the one doing all the work (meditating, once a day, for 10-minutes, for 30-days). "What happens if I miss a day?" The goal is not perfection. The goal is working at your habit for 30-days. That doesn't mean perfection, that means working at it. Sometimes that means missing a day, depending on life. You have to do the work. You have to take ownership of your own outcome. That means accepting that if you miss a day, that's perfectly okay, and you will continue forward with your practice. "You mentioned you'd be sending an email every day. Are you sending them in the morning or afternoon?" You'll receive your email ever-day at 4:30 pm Pacific Time. That way, the email will serve as a reminder to meditate at the end of your workday or if you wait to act on it, a reminder to meditate in the morning the following day. Calm (and Coach.me, the free group accountability app I recommend that you use) both let you set reminders to meditate at the time you pick. You can follow the schedule that works for you or you can meditate at the end of the workday. You do you, friend. "Do I need to use Calm?" I recommend that you use Calm. If you want to join this 30-day challenge, you can do it with the meditation app of your choice. I've used Calm for the last 3+ months and it's the one freakin' thing that helped me develop a consistent meditation habit. That, to me, is huge. Huge! You'll use Calm's free plan for the first 7-days of the challenge and, after that, subscribe to a Calm plan for $19.99/year - $69.99/year. With Calm, you'll get my suggestion on what meditation to listen to, helping you know what to do next. I recommend you use Calm. You can read a very professional review of the pros and cons of Calm here. "Do I need to use Coach.me?" Coach.me is an excellent way to track your progress and for us to cheer each other on towards our shared goal. Support from your peers is a great way to stick with a habit and Coach.me will help us support each other in building our meditation habit. Coach.me is not required. It's optional and encouraged. Sure! Email me directly at kai@kaidavis.com. I read 100% of the email I get and reply to as much as I can. 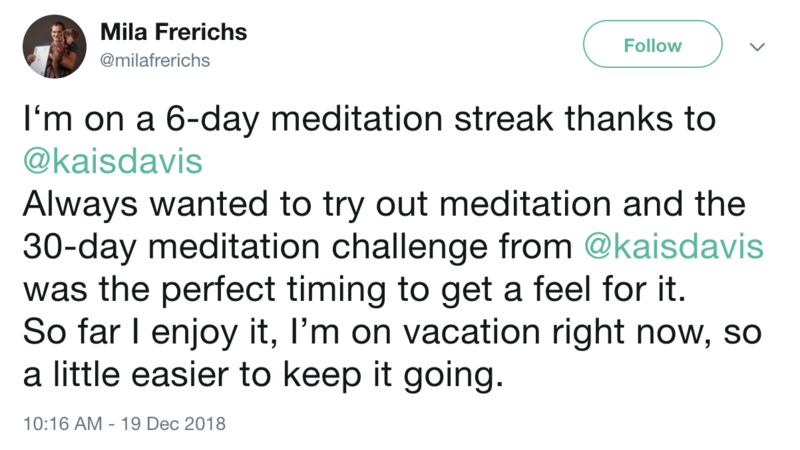 How do I join the 30-day meditation challenge? Look for the starting email shortly.